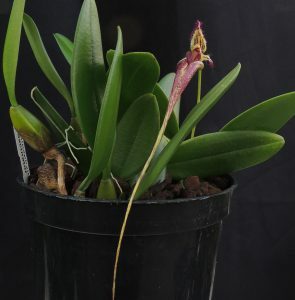 This is another remarkable Bulbophyllum species with large flowers that have intriguing fillaments of bright purple pink attached to the petals and sepals. This was one of our focus species on Thursday as the species is native to lowland forests in Malaysia, Borneo, Sumatra and the Philippines and so of special interest to our visitors from malaysia. This is a warm growing species and at home in our Warm Asia section. We find that the plant does well in pots or baskets and enjoys shade during the summer months. This species shares similar characteristics to other fly pollinated Bulbophyllums but does not have a particularly bad smell. 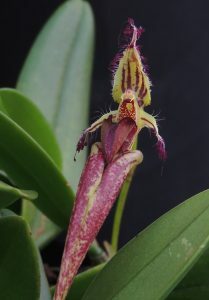 The flowers are produced individually but they make up for lack of numbers by their size compared to the plant and the flowers can be up to 20cm long. Here is a view from further back.